Home » Healthy » Why Stop Smoking? Smoking has become a small object of the most popular. Smoking has become a lifestyle for many men and women, even including children and adolescents. Smoking habit has resulted in many diseases of the respiratory disorders to cancer. Although aware of the dangers of smoking, people around the world continues sucking tens of billions of cigarettes every day. The number of smokers in Indonesia was ranked third highest in the world. The number of smokers in developing countries far more than the number of smokers in developed countries. A very alarming figure considering the bad consequences of smoking will be felt in the long run. Any substance contained in a cigarette? Nicotine is the main substances contained in cigarettes. However, more than 700 kinds of chemical additives may be used by tobacco companies to add to the enjoyment of smoking. Some materials are so toxic that even some of the major cigarette manufacturers will usually have a high standard to dispose of toxic materials that are very dangerous. Passive smoking can have a negative impact is more dire if the smoke they inhaled. In addition, cigarette smoke contains 4000 chemicals, including arsenic, acetone, butane, carbon monoxide, and cyanide. Cigarette smoke inhaled by smokers and passive smokers will contain 43 substances known to cause cancer. That's why for the second-hand smoke can have a negative impact is more dire if the smoke they inhaled. Smoking is also one of the main causes of the attacks of heart . The death of a smoker as a result of heart disease more than the deaths from lung cancer. Even low-tar cigarettes or low-nicotine cigarettes will not reduce the risk of heart disease. Because some of the cigarettes that use a filter to increase the number of carbon monoxide is inhaled, which makes cigarettes are even worse for heart than cigarettes which do not use filters. Nicotine contained in cigarettes can make your heart beat faster and increases your body's needs for oxygen. Cigarette smoke also contains carbon monoxide is poisonous. These toxic substances walked to actually impede blood flow and oxygen flow to the heart and other vital organs. Nicotine can narrow the blood vessels so more oxygen flow slows again. That's why smokers have an increased risk of heart disease is very high. Cigarettes from tobacco smoke contains many cancer-causing chemicals. Inhaled smoke contains many chemicals that can damage the lungs . These substances can trigger cancer, especially in the lungs. Lung cancer is the most common cancer caused by smoking. The spread of lung cancer occurs in the body quietly until a higher stage. In many cases, lung cancer kills quickly. Heavy smokers who have for years will have emphysema. Emphysema is a disease that will gradually make the lungs lose their elasticity. If the lungs lose keelastikannya, it will be difficult to remove the dirty air. The signs are already having trouble breathing in the morning and evening. Then easily breathless.Another sign is often experienced severe flu, accompanied by a severe cough, and possibly with chronic bronchitis. Cough often does not stop and become chronic. The results of a study of smokers showed that smokers face of men and women are more wrinkles than those who do not smoke. Premature aging process has increased in accordance with the habits and the number of cigarettes smoked.The study showed that heavy smokers have wrinkles on the skin is almost five times higher than nonsmokers. Even the premature aging process has already begun for adolescents who smoke such as skin wrinkles, yellow teeth and bad breath. The negative impact of smoking does not only harm the lungs, heart, and respiratory tract. Smoking habits according to research can damage other body tissues. Dozens of diseases related to tobacco use and even includes pneumonia (pneumonia), gum disease, leukemia, cataracts, kidney cancer, cervical cancer , and pain in the pancreas. 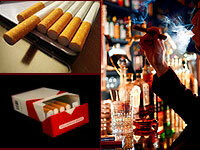 The reason for the toxins from cigarette smoke spread everywhere through the bloodstream. Smoking can cause disease in nearly every organ of the body. Are you aware of the dangers of smoking? As a result of smoking to health body really hurt. According to statistics, around the world, the number of smokers who die from diseases caused by smoking amount to nearly three times the number of people who died from alcohol and drugs. Even the number of smokers who die from the disease amounted to six times higher than in a car accident. In addition, smokers usually age 13 to 14 years shorter than people who do not smoke. After reading these facts, whether you are going to be like that even though smokers have read so many horrible facts in relation to smoking and then decided to stop reading the article? Or you dare say no tocigarettes? Related Posts : Why Stop Smoking?